Delegates arriving at Geneva Internationl Airport may obtain a free "Unireso ticket" from the ticket machines in the baggage collection area of the airport (before Customs). Tickets are valid on the Geneva public transport network for 80 minutes. All visitors staying in Geneva hotels can obtain the free Geneva Transport Card. This personal, non-transferable pass gives the holder full access to Geneva's public transport network for the duration of their stay. Passes should be requested at the hotel reception desk on check-in. Access to the WIPO campus is via the WIPO Access Center located on the north side of the WIPO AB Building. Warning – Access to and presence on the WIPO premises is restricted to persons wearing an official badge. Smoking is prohibited inside WIPO buildings. 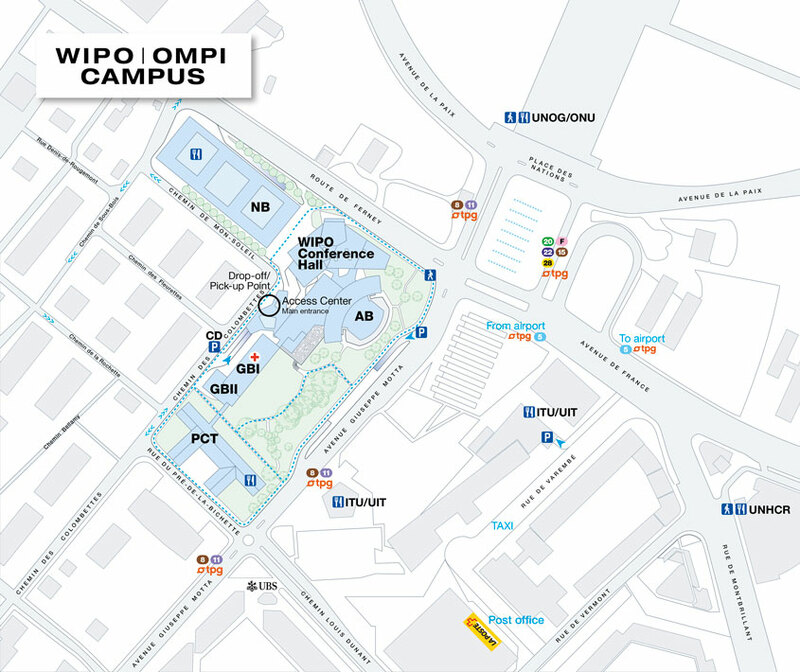 Designated smoking areas are located around WIPO buildings. A number of PCs, with free Internet access and shared printer, are available. Access is on a first-come/first-served basis. In the interests of other delegates, users are encouraged to reduce their access time in case of high demand. WIPO Library (first floor of the NB Building). WIFI is available in all public areas. The access code will be provided to delegates at the WIPO registration desk. Users are requested to limit heavy downloading of information. Offical WIPO meetings are publicly webcast. Sessions remain available as video-on-demand for a period of one year. Self-service cloakrooms are located outside the plenary room of the Conference Hall and Room A in the WIPO AB Building. These areas are unattended; WIPO takes no responsibility for any loss or theft of property left there. Delegates are encouraged not to bring luggage to WIPO and to secure personal property at all times. A number of lockers are available at the reception of the NB Building. Lost and found – all inquiries should be addressed to the WIPO Access Center (Tel: +41 22 338 7942 or +41 22 338 7944 – available 24/7). A cash dispenser is available on the ground floor of the WIPO GBI Building (right-hand side of the lobby of the WIPO AB Building). Swiss francs and Euros are available, using internationally-recognized credit cards. The closest bank is the UBS Vermont-Nations Branch, 17bis Chemin Louis Dunant, 5 minutes walk from WIPO. Opening hours: 08:30 to 16:30. (Cash dispenser ATM 24/7). The nearest post office is located at the CICG Conference Center, 17 Rue de Varembé. Opening hours: 08:00 to 12:00 and 14:00 to 18:00. WIPO's cafeterias, located in the PCT and NB Buildings, are open from 08:00 to 17:00. Lunch is served from 11:45 to 14:00. Both cafeterias offer a large variety of dishes, including vegetarian and take-out options. A coffee/tea lounge with coin operated vending machines is available on the 13th floor of the AB Building. Water dispensers are available throughout WIPO buildings, rooms and corridors. A number of cafés and restaurants are situated within walking distance of the WIPO campus. Consumption of food and drinks (except water) is not permitted in WIPO meeting rooms. The WIPO Library, located on the first floor of the NB Building, is open Monday to Friday, from 09:00 to 17:00. Important – All participants at WIPO events are responsible for obtaining their own visa. Participants at WIPO meetings are expected to make their accommodation arrangements. WIPO does not have a hotel reservation service. Participants should book hotels directly or through their permanent missions. The Geneva Delegates Welcome Service (CAGI) offers logistical support for planning of accommodation and may grant financial aid to participants from least developed countries and non-governmental organizations, on a case-by-case basis. CAGI also offers free access to computers at a reasonable walking distance from WIPO (5 minutes). The service is available from 09:00 to 17:00 on week days and, subject to registration, from 06:00 to midnight on week-ends and public holidays. For more information contact CAGI.